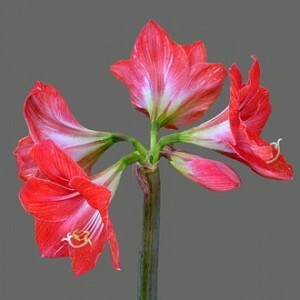 Plants of the sort Hippeastrum are the most widespread representatives of the family of Amaryllidaceae. Often this plant is called mistakenly the Amaryllis. The sort of plants of Amaryllis came to us from South Africa and totals only one look – the Amaryllis fine, and the homeland of the Hippeastrum is America. The name of a plant came from a combination of the Greek words "hipperos" and "astron" which can be translated as "a knightly, or kavalersky star". The Hippeastrum bulb roundish or oval (5-10 cm in the diameter), has a short stalk and closed scales. The root system consists of numerous fleshy roots about 30 cm long. Leaves are linear, about 5 cm in width, and 65 cm in length. Part of a stalk with one sprout (which the hollow stalk without leaves reaching in height of 90 cm represents) and four leaves (3 from them have the closed basis and 1 – not closed) make a cycle. The inflorescence is formed only from a leaf with not closed basis and has an umbrella form. Garden encyclopedia. Hippeastrum. Care and growing rules.